Needle Beetles. 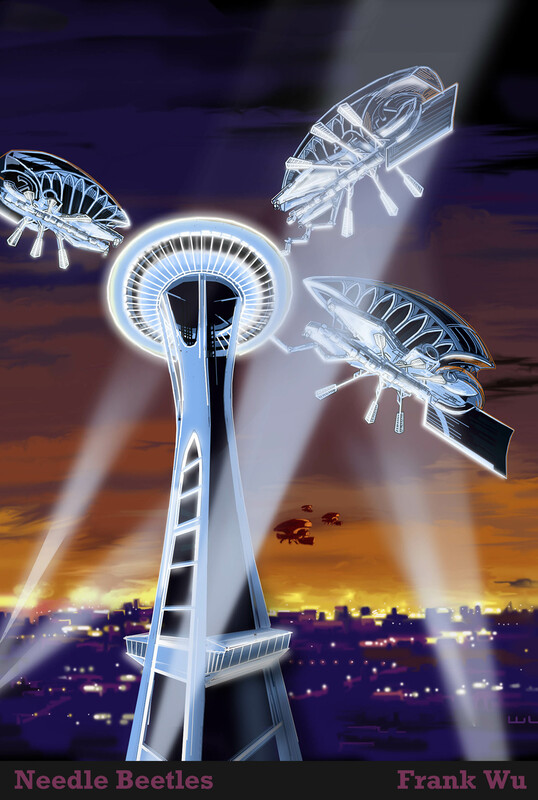 Digital image done for the (unfortunately unsuccessful) Seattle in 2011 Worldcon bid. Then it was suggested by Jerry Gieseke that the ship should be docking with its buddies at the Seattle space needle (see above). Then that image inspired kara_gnome to suggest that the ships be called "Needle Beetles." Which in turn inspired Kai Jones to write a poem, which was attached to the art (which has been dragged to sci-fi cons as far away as Japan). This in turn has inspired Lynn Gold to write a "Needle Beetles" song (to the tune of "Rockin' Robin"). Thus: Bobbie DuFault's idea (via Jay Lake's mind) --> my art --> Jerry Gieseke's idea --> my second art --> "Needle Beetles" phrase from Kara Gnome --> Kai Jones' poem --> Lynn Gold's song --> (we hope) a successful worldcon bid. I love this collaborative effort! And... how many worldcons (or worldcon bids) have their own theme song?